Greetings, your grace, and welcome. Your father the Lord Duke was most pleased to learn how far you have advanced in your studies, and has instructed me to begin your tutelage in matters of history and Lore. Yes, I am sure that your sessions with the swordmaster seem much more important, but you must understand: to rule others you must first know and understand yourself. How can you know yourself if you do not know the history of your race, and the great legacies that have been bestowed on Humankind? Take heart, my child, this first lesson shall be brief enough. And the tale is quite engaging, if you let yourself truly hear it. You have listened attentively in chapel, and so you have heard the great litanies recorded in the Book of Staves, and know the story of Mankind's origins. I can do little to improve upon the account given in Holy Scripture. The first Humans were the Titans, created by the All-Father's mighty hands just after the beginning of Time. The number of the Titans was thirteen: seven great men and six women, fashioned from clay and earth and imbued with the All-Father's Grace, Spirit, and Power. Fragments of ancient legend recall their names: Ardan the King, who married Kathellerin the Matron, Torvald the Strong and his willful bride Lashava the Tempestuous, Golgerim the Smith and his wife Gillaya the Healer, Gorum the Hunter and his proud wife Hevralis the Tamer, Wendol the Plowman and Colwynne the Midwife, and Arnomus the Rogue who married Virenna the Fairest. The last of the Titans, the Magician, was given no name, and took no bride. Some ancient legends say that the All-Father was interrupted before he could finish the last Titan's bride, while many Wizards claim that the Unnamed One was built precisely to his Father's will, and embodies the boundless potential and eternal restlessness of all Humankind. Humanity was the first Race born after the beginning of Time, and thus we were born mortals, slaves of age and death. The Titans live lives that can outlast Ages, yet we their children are short lived, and were truly mortal until the Turning. Of all the World's Children, we are the only ones born wholly of the All-Father and His Will: He fashioned us to rule the World that He had made, and when the Titans were finished His great vision of Aerynth was finally complete. The favor He bestowed upon Mankind has earned us the wrath and envy of all the other Children of the World. More than once they have tried to take our birthright from us, and rob us of our destiny. They shall always fail. I fear I digress: this is to be a lesson in Lore, not spirituality. I'm sure [[Prelate] Korvin will answer any questions you may have about the spiritual purity of Humankind. I must now return to the Titans, and the mark they left upon the chronicle of history. After they were fashioned, the Titans journeyed to a bountiful valley, and lived there as kings. The First Men quickly settled the valley, and named it Ardan, for their King, and it became the first realm of Men. Ardan ruled in the kingdom that bore his name for more than two thousand years, a period of time Scholars have named the Shining Years. Tragically, the memory of his reign and his realm has been lost to us. Little is known of that blessed land, for it came to a cruel and bitter end. There are, however, some things that can be surmised from the few legends and fragments of Ardan that remain. We know that the Realm of Ardan was a paradise of beauty and enlightenment, where the Titans dwelt among their children, and were as Demigods in power and majesty. The six nations of Men were born of the six families of the Titans, each with its own virtues. We know also that the Men of Ardan fostered great friendships with the Dwarves and Centaurs. We know from ancient records in the keeping of the Holy Church that the All-Father dwelt among the Titans and Men of Ardan for a time, but that He had to leave them and undertake a great quest, for a Shadow fell upon Ardan early in that kingdom's history. Darkness sought to enter the World, and it poisoned the spirits of the Dead. They rose up in restless hordes, banding together in an Unholy Legion that plagued the living. The All-Father journeyed into the Void to confront Death itself, while the Men of Ardan fought the War of Shadows against the Dead. Victory was finally achieved, but the All-Father stayed away, following His quest to unknown ends. The war against the Dead was won, but the Blessed Realm of Ardan was not devoid of strife: even in those days the natures of the Titans were not always in accord. There are hints, hidden in the legends and sagas of the Northmen, of Torvald's many quarrels with Ardan. Finally the willful Titan led his children from the Blessed Valley to the Frozen North, searching for a land they could call their own. They were not the only Men to leave the Blessed Realm: sometime in the second millennia of Ardan's race the mysterious seventh race of Men, the Anomani, arose. Dismissed as Thieves and scoundrels, their parentage remains uncertain. The Anomani were exiled from Ardan by the King's command, and no tale recalls their fate. Yet even these divisions were as nothing compared to the strife that was to come. The Elvish Empire soon became aware of the Ardani, and the very sight of the All-Father's true children filled the Elves with envy and malice. The Elves quickly made war upon the First Kingdom, but the might of the Titans was enough to hold the Elvish host at bay. Frustrated by the failure of their arms, the Elves, as is their nature, resorted to sorcery and vile treachery. Their greatest Magi and Loremasters devised a mighty curse, a ritual so powerful that it would doom all of Humankind. As the armies of Elves and Men continued to skirmish, the Fey Magi worked their great spell in secret, and a great Doom fell upon the folk of Ardan. A plague swept the Blessed Vale, a sickness that burned in the blood, killing countless Men outright and driving the rest to madness. The destruction of Mankind would have been complete but for Ardan, the Shining King. He bore the brunt of the terrible spell, drawing its power into himself to spare his kingdom. The Elvish spell was too powerful even for him, and so the First Man died in unspeakable agony. The other Titans, raving in their madness, were captured by the Elves and bound in magical prisons. There are some who claim that Torvald and his children were spared the bitter taste of the Curse, but the truth of these legends will never be known. Most of the Sons of Men died in agony, and the few who survived were stricken dumb, their minds reduced to those of beasts. The Elves were quick to follow upon the heels of their great spell. They plundered the great palaces of Ardan, and destroyed or stole all they could. Legend has it that a few ruins of the Blessed Realm remain, lost somewhere in the wilds, but none now living can remember where. The Doom that came to Ardan was swift, terrible, and final. Thus the Shining Years ended, and the Cruel Years began. Men lived as beasts in the Cruel Years following the Curse, and the wicked Elves hunted them for sport, or took them in chains to live as pets and slaves. Whipped and driven to endless toil, the lot of the Sons of men was cruel, and we must never forget the bitter fruits of Elvish envy and ambition. The cruel Elves had unmade the minds of men, and stolen their memory and their history from them. In time, they also strove to unmake even their bodies. Foul magery was loosed upon some unfortunate thralls, who became the victims of all manner of hideous experiments: thus were the Minotaurs born of Elvish wickedness. The great Captivity of Man was to last a decade less than two thousand years, and though through all that time the Elves tried to destroy Humanity, the Will of the All-Father will not be denied, and even their Magic could not thwart it. Even as they served in chains, the Curse began to weaken, and the Sons of Men were quick to learn from their captors. The arts of speech and language were stolen back from their Elvish masters, and soon a clever band of thralls managed to free an entire legion of slaves. These rebels fled from the Elvish Empire, and though the pursuit was swift and terrible, they were finally able to reach the Vast Steppes, and took refuge there. Wandering the plains, they named themselves the Freed, and longed to find a way to free the rest of their kin. In their travels they quickly learned to survive in the wilds. There they also met the Centaurs, and the course of Human history changed forever. The children of Kenaryn taught those Human refugees many things. At last the Sons of Men learned of their true heritage, for the Centaurs had traded long with Ardan, and remembered the Blessed Realm well. The Horse Lords taught the refugees to worship the All-Father and Kenaryn, his loyal Companion. They also taught Men much about Law, and Warfare, and History. Centaurs have long memories, and still remembered both the fall of Ardan and the Great Betrayal, when the Elves had first turned their backs on the All-Father's grace. And so at last the treachery of the Elves was undone, for Mankind had reclaimed its stolen identity and legacy. The Freed grew mighty in arms, and left the Steppes, founding a Hidden Kingdom near the Elvish Empire. The Men of the Hidden Kingdom worked long and hard to free their brethren still in chains. For decades they launched raid and skirmish across the boundaries of the Elvish Empire, and the strife between Men and Elves intensified. Finally, as the Sun darkened in the sky, a great band of raiders led by Torvagau the Liberator sacked an ancient library. From its ancient texts Torvagau learned where the Titans had been imprisoned, so long ago. As the Elvish kindred turned upon each other in the War of Flames, Torvagau and his band of heroes crept into the very heart of the Deathless Empire, spreading the message of freedom wherever they went. Throughout the Elvish Empire, Humans rose up by the thousands, breaking their chains and turning the tables on their former masters. In the chaos, the Liberator reached the Titans' prisons, and broke the mighty spells that held them shut. The Titans were freed, and they led the Sons of Men out of slavery and into the wide World. And now the history of Humankind becomes not one story, but six, for the nations of Humanity scattered to the corers of the World, each seeking a homeland of their own. New Kingdoms, realms of Men, arose. Much could be told of the histories of the Invorri of the North, or the savage Horwathi of the East, or the mysterious Irydnu. Perhaps, in time, you shall learn more of them. For now, I shall tell you the tale of the Ethyrian Race, born of Ardan and Kathellerin, mightiest of all the Sons of Men, the true heirs of the Blessed Realm. The Ethyri journeyed far to the south, and settled along the coasts of the Sea of Gwalinnen. There they founded the kingdom of Ethyria, and made Torvagau the Liberator their King. To his splendid court came Draethen Truesword, immortal Son of the All-Father, and he gave King Torvagau a mighty sword called the Trueblade, greatest of the jen'e'tai, which legends say shone with the light of all the stars. The Cruel Years ended, and the Time of Heroes began. For a few generations the New Kingdoms prospered, and Heroes arose whose names are still celebrated today. The Time of Heroes was the time of Dangorn, of Almeus the Young, Sesheth the Hunter, Finn ap Cummil, and Diarmid mac Roan. So the Sons of Men enjoyed a second golden age, but it was all too brief. In the third century after their foundation, the New Kingdoms were washed away in a tide of blood. The Hordes of Chaos had come to Aerynth, bringing with them the War of the Scourge. The Irydnu fled to lands far beyond the ken of Man, the Gwendi were nearly destroyed, and the War Lords of the Ethyria fared little better. Three of the Titans fell defending the World, and entire tribes and kingdoms were blotted out, destroyed by the Hand of Chaos. The terrors of war can drive even dire enemies to work together in the face of destruction, and so it was that the Elves first approached the Human Kings with offers of alliance. Some of the Fair Folk had not forgotten the wisdom of the All-Father, and proclaimed that His children must stand together or all would surely perish. Two thousand years of bitterness and suspicion were not easily forgotten, however, and it was not until the Centaurs urged the same that the Sons of Men listened. The Grand Alliance was finally formed, and Men fought beside Elves, Giants, and Centaurs against the tide of Chaos. Our strength served the Grand Alliance well, and Human soldiers stood ever at the fore, and many Ethyrian heroes gave up their lives for the good of all. Human valor, coupled with the Giants' strength, Elvish magic, and the Centaurs' cunning, was enough to halt the spread of Chaos. Indeed, the first Dark Lord was slain in battle fell to the hand of a Human. Beregund the Bladeseeker, the Hill Man who lost his tribe and found the sword Shadowbane, he brought the Great Alliance its first true triumph. Alas, at the very threshold of victory ancient hatreds arose anew. Beregund was murdered, slain by an Elvish queen who took Shadowbane for her own. The cruel woman was consumed by Chaos and Shadowbane was lost. The Sons of Men roused themselves in anger, for this new Elvish villainy was too much to bear. Ivard Kandorian, greatest of the Generals of Men, marshaled his troops and prepared to avenge Beregund's death. The Grand Alliance teetered toward collapse, and it seemed as if Aerynth was doomed. At this, the darkest hour of the War of the Scourge, Aerynth was finally delivered from the hand of Chaos. The All-Father returned, and with Him came His host of Archons, who fell upon the legions of the Dark Lords and decimated them. With the All-Father came Ardan, delivered from Oblivion by his Father's hand. The All-Father called all of the Titans to Him, and all of His Companions as well. So it was that Kenaryn came, and Thurin too, though the Shaper's children stayed hidden in the deeps while the Sons of Men bled for them. Even Malog came, for the Fallen Warrior could not defy his Master's will. The Grand Alliance was renewed, and Gods, Titans, and Archons led its armies in the last glorious campaign. They drove back the forces of the Dark Lords, even unto the dreaded Chaos Gate. Yet these triumphs were not enough, and so the All-Father led an invasion of Chaos itself, with Ivard Kandorian fighting at His side. But Malog's treachery put an end to the glorious battle, and the All-Father withdrew before a final victory could be achieved, leaving his fallen Companion to rot in the pits of Chaos. Hedrusiel the Archon sealed the Chaos Gate, and at last the War of the Scourge ended in victory. Aerynth was saved. Grand and joyous were the celebrations after that last battle. The All-Father proclaimed that He would leave Aerynth again, and four of the surviving Titans would go with Him to His Holy Refuge. The governance of Aerynth He gave to the Sons of Men, His true heirs. The Grand Alliance was declared eternal and everlasting, and the Kingdom of Ethyria was forged anew, with Ivard Kandorian as its first King. The All-Father then departed, leaving His children to their destinies. The Age of Days had ended, and the Age of Kings began. The New Kingdoms had all been broken, as had the Deathless Empire of the Elves. The Fair Folk withdrew to mourn what they had lost, while Humanity rebuilt. Ethyria, despite its glorious beginnings, did not long endure. The Bards still sing ballads King Konwyn, the seventh King of Ethyria, and of Konwyn's Folly. For the love of a woman the King betrayed his bannermen, and feuded even with his own kin and most trusted aides. Konwyn's lust threw all of Ethyria into chaos, and shattered the Kandorian Line. When at last the wars had ended, Ethyria was no more. In its place stood ten new kingdoms: the realms of Alvaetia, Brethild, Carloon, Caledorn, Escalandor, Ghand, Lambourne, Melvaunt, Sorwenfells, and Vanderlund. Some claimed that the Ethyri had squandered their greatness, and sullied the gifts the All-Father had given us. This was not the case. Our mighty race but slept, dreaming of future glories, of a time when the Ten Kingdoms could be united again into one. Centuries passed, and the Sons of Men reached new heights of glory. Many Arcane Arts were rediscovered, and soon the lands claimed by Men were expanding faster than they could be mapped. And yet strife always plagued the Sons of Men, for the Nations that had been born of the Titans seemed doomed to fight their fathers' quarrels for eternity. The Men of the Frozen North raided the Men of the Ten Kingdoms, who in turn fought long wars with Irydnu and the Free Cities of Tariponto. The Church of the All-Father, which had existed as two separate faiths among Elves and Men, finally was united, and early in the Age of Kings a Human Prelate took his rightful place as Patriarch of all the Faithful. The Church grew mighty indeed, spreading messages of peace and brotherhood that drowned out all other creeds. The Age of Kings was a time of wonder and glory, a thousand years of legend that ended with a century of slaughter. And with its end came the sundering of Aerynth, and the death of Greatness. The time has come at last to tell you of the War of Tears, and the coming of the High King. Much of the tale you have heard already, I am sure, for it is the stuff of legend. And yet the harper's verses can blur the image of past deeds, and sometimes the past can only be viewed through the eyes of a Chronicler. Listen then, to the accounts that have been left to us, and learn. Though countless sagas have been written of the treachery of the Elves and their brutality during the War of Tears, it should not be forgotten that the Kingdom of Ethyria and the Ten Kingdoms that came after it lived in peace with Elvenkind for nearly a thousand years. Indeed, there was trade and commerce between the Ten Kingdoms and the Hidden Court, such accord as had not existed since before the fall of Ardan. As the Age wore on, however, new stresses would be placed upon that fragile friendship. At the dawn of the ninth century of the Age of Kings the Chaos Gate opened for a second time, vomiting forth Morloch the Fallen God and his Twisted Breeds of Orcs and Ogres. Once the threat to the World was discovered, the Sons of Men fought alongside the Elves a second time in the War of Ashes, united again against Chaos. The Maimed God was a terrible foe, and wrought ruin wherever he tread, but finally Torvald the titan descended from the North, and joined with some of the dreaded Elves called Sidhe to face Morloch in combat. The scars that battle left upon the World still linger, so the tales say, and at last Morloch was defeated. With their master broken, the Orcs and other Twisted Ones were no match for the armies of Elves and Men. Victory came at last, and with it peace. And yet this great peace was but an illusion, for base pride still festered in the hearts of the Elves. In the nine hundred and thirteenth year of the Age of Kings, all Aerynth resounded with a piece of mighty news. A great celebration was to be held, commemorating the thousandth year of the Grand Alliance. There, at a festival of friendship, friendship between Elves and Men died forever. The great festival was held in Mellissar, capital of Alvaetia, the largest and mightiest of the Ten Kingdoms. There came the Ten Kings, the Lords of other nations of Men, the Princes of the Centaurs, the Elfking in his splendor, and even the Chieftains of the Giants. All of them came together for the first time in centuries, to feast, revel, and remember the past. On the fourth night of the feast, King Konrad of Alvaetia made a mighty toast before the banquet. The Bards have remembered it as Konrad's boast, a speech that would make all of the Ten Kingdoms bleed. "Grand and wondrous guests," the King began, "I welcome you, in the name of Peace and Brotherhood, to this my hall. It is only just that so grand an assembly should gather here, in the mightiest kingdom of the Sons of Men, whom the All-Father in His wisdom has granted dominion of all Aerynth." At this, the tales say, there were murmurings from all of the guests, Elves, Centaurs, and even foreign Men. But King Konrad proceeded. "We children of the Titans may not have been blessed with the long and glorious histories that some of our allies so cherish: we are, indeed, a young people. But Fate and Time have granted us a wisdom beyond our years - for truly, of all the Children of the World, the Sons of Men have endured more sorrows and more suffering than any other. So our vigor shall ever be tempered by wisdom, and our memories of war shall ever ensure the peace." At that point, Valdimanthor and all of the Elvish delegates sat down, and overturned their cups. In the outcry that followed, Valdimanthor was heard to speak but once. "Suffering, you say? Tell me, mortal, do you recall the rising of the Dragon?" By the morning, Valdimanthor the King of Elves had left the festival, and within the year the War of Tears had begun. Elvish hosts led by Valdimantor surged forth from the depths of the forest, strengthened by legions of hideous Minotaurs. The entire Kingdoms of Escalandor and Ghand were consumed by Elvish wrath, and the rest of the Ten Kingdoms fared little better. All Ten Kingdoms might have held against the Elvish onslaught if they had stood together, but each King saw only profit in the destruction of his neighbors. And so for decades the Elves ravaged the lands of Men. Finally when King Konrad and all his sons were slain, the Elvish host returned to their forests, their pride avenged. This bitter conflict should have roused the Sons of Men to action, but greed and Elvish spies ensured that the Ten Kingdoms would mount no reprisal. Every petty Duke and Baron scrambled to win the throne of Alvaetia, spurred on by false advisors or sheer avarice. Two brother Knights fought for decades, dragging the rest of the Ten Kingdoms into their feud. The remnants of Ethyria were consumed by strife and drowned in blood until the coming of Cambruin, the High King. Born of a lesser noble in the kingdom of Caledorn, the blood of Kings flowed in Cambruin's veins, for he was of the Kandorian line, the last true scion of the Kings of Ethyria. 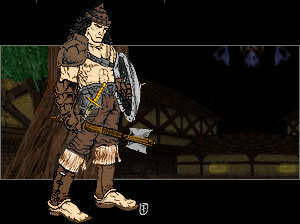 Cambruin's virtue and strength of arms won him fame throughout Caledorn. When the realm of Brethild laid siege to Caledorn, Cambruin's daring tactics saved his homeland. A young man of only seventeen, Cambruin single-handedly drove back the armies of the Brehtildi invader, and his fame was assured. Essengal the King of Caledorn abdicated his throne, yielding the crown of Caledorn to Cambruin as his reward. Some say that Essengal had been visited by Archons who foretold the youth's coming glory. After Cambruin's coronation, ancient documents were discovered that proved Cambruin was truly born of the Kandorian Line, and word quickly spread throughout the Ten Kingdoms that Cambruin was the chosen of the All-Father, the instrument of Humanity's salvation. The young King proclaimed that the time had come for Ethyria to rise a third time, and he took the Golden Lion of Ethyria for his coat of arms. Countless Knights flocked to the young king's banner, and the kings of Brethild, Esclandor, and Ghand named Cambruin their overlord. There were many, however, who denounced this upstart boy, and they all joined together in war against him. Cambruin and his army of Champions waged a quick and brutal war, remembered by Bards as the Contest of the Seven Crowns. None of the other kings of Men could hope to prevail against Cambruin, who finally defeated his enemies at the Battle of Saint Wend's Hill. Cambruin was crowned High King, and under his rule the Ten Kingdoms became the High Kingdom. Merciful to his foes, Cambruin brought more than mere armies to the lands he conquered: he brought Law, Order, and Justice. Commoners loved him, and only the pettiest warlords feared him. The Code Cambruin devised is still regarded as the pinnacle of chivalry and decency among Men. Thus the Ethyri reclaimed their ancient glory, and the High Kingdom shone as the fairest realm in all the World. The High Kingdom was sorely tested, and fought wars against the Orcs, the savage Northmen, and even the Men of faraway lands. Cambruin was always victorious, until the War of Tears resumed in the tenth year of his reign. Cambruin invaded the Elvish forests, trying to take back large tracts of Escalandor and Ghand that had been seized when the war began, but he rode straight into a trap. For twenty years Valdimanthor had been waiting and gathering his strength, and he had followed the High King's rise with contempt. Legions of Elves and Minotaurs savaged Cambruin's armies, while mighty spells wreaked havoc and unleashed disasters throughout the High Kingdom. Cambruin and his Champions escaped the steel jaws of Valdimanthor's trap, but they could not prevail against the army that invaded the lands of Men again, and in the years that followed it seemed that Cambruin's glory was doomed to fade, like a dream born too soon. But Humankind had eluded the cruel hand of Fate before, and the High King's reign was far from over. Just when tidings looked darkest, Caeric Blackhammer, First Paladin of legend, achieved the Second Quest for the Sword, and delivered Shadowbane into the hand of King Cambruin. The High King met Valdimanthor in personal combat at the Battle of Rennelind Field, and slew him with that mighty blade. The entire tide of the War of Tears changed with that single stroke. As Valdimanthor died, so died the magical pacts between the Elves and Minotaurs, and the morale of the Elvish Host was broken. In the long years that followed, Cambruin and his Champions enjoyed victory after victory, and cut their way into the very heart of the Elvish lands. But even as the High King's Elvish enemies fell in droves, new perils beset the High Kingdom. Caeric the Paladin's holy calling offended many worldly knights, and feuds between the Knight of the Sash and several of the more worldly Champions soured the court. The Holy Church, who had been quick to crown Cambruin, grew nervous once the High King held Shadowbane in his hand. Fearing that Cambruin might eclipse the glory of the Patriarch, the Church withdrew its support from the War of Tears, and even offered up safe haven to many Elves. Tariponti freebooters, hordes of Northmen, Orcs from the wastes, and even the mysterious Amazons were quick to raid the unwatched flanks of the High Kingdom as Cambruin campaigned far afield. Vicious plots born of jealousy nearly split the court, and Queen Bronwyn herself was accused of Sorcery and Witchcraft. And yet, no matter the odds, Cambruin prevailed against every trial, every hardship. His will and virtue brought contentious Knights and Champions back in line, and his military might repelled all invasion. The Queen's innocence was discovered, her malingers punished, and finally, after nearly a decade's distraction, Cambruin undertook his final campaign against the hidden Court. The Elvish Empire was dying, but Mankind's direst enemies had one last treason to perform. As they had with Ardan and with Beregund, the Elves destroyed Cambruin through treachery. It is whispered that prisoners taken in battle poisoned the ears and heart of one of the Champions with lies and promises, and so one of the Champions sold his King to slaughter. Who was this Traitor? Not even the wisest of scholars can answer with any certainty: the tumult of the Turning and the sundering of Aerynth have left few clues. Saint Malorn of the Temple of the Cleansing Flame has testified that the Traitor was Sir Sesherin, the Aelfborn who turned cloak to became one of Cambruin's Champions. The Living Saint claims to have seen the deed, and has proclaimed that Sesherin's Elvish blood could not endure the final death of his true people. More than one critic of the Temple has suggested that Sir Malorn himself did the foul deed, fearful that Cambruin intended to call a truce before the last Elf was destroyed. Others have put forth the name of Sir Hurrigan the Huntsman, who had renounced his calling as a Ranger to ride under the High King's banner. Hurrigan, it is whispered, feared that Cambruin's thirst for blood would not end with the destruction of the Hidden Court, and slew Cambruin to prevent an endless crusade against all the Children of the World. Many chroniclers have sought to prove Sir Eric guilty. Eric was the son of Essengal, former crown prince of Caledorn, whose sister Essenmay Cambruin had pledged to marry but then passed over in favor of Bronwyn. These scholars (most of whom, it should be noted, work in the employ of Eric's current rivals) have gone to great lengths to prove that it was Eric's sister Essenmay who started the vile rumors that culminated in the accusation and trial of Queen Bronwyn, and that Eric killed Cambruin to regain his stolen birthright. Some have raved that Cambruin's murderer was not a mortal man at all, but Morloch the Destroyer, working in the enchanted semblance of one of the Champions to try to steal Shadowbane. If this was indeed the case, the Fallen God's own strength betrayed him. All of those accused of the vile deed deny it, though many of them stand at the forefront of the struggle to regain Cambruin's crown. The identity of the Traitor may never be known, and in the end may not even be important. One certain fact is known, and cannot be forgotten: on the day of his greatest victory, Cambruin died on the point of Shadowbane. So ended the Age of Kings, and so began the Turning. Mountains crumbled, seas surged, and entire realms vanished as great fragments of the World spun off into the Void. The Sun darkened, the Moon froze full, and the voice of the All-Father fell silent. Nearly a century has passed since that dark day, a time of chaos scholars have named the Age of Strife. In the wake of the Turning, Mankind has found a sort of immortality, for the dead now find themselves returned to flesh thanks to the Trees of Life. The High Kingdom is shattered, and the original Ten Kingdoms are broken as well, their lands split into great fragments and scattered in the Void. All that is left are the Petty Kingdoms, dozens of tiny states ruled by Guilds or Warlords, each vying with all the rest for supremacy. The Sons of Men are now as divided as their World; the Irydnu war upon the Petty Kings, the Horwathi raid with wild abandon, and war bands of Northmen are on the move again. The Church of the All-Father is wracked with schism, and the new Temple of the Cleansing Flame has embarked upon a crusade to destroy all that is evil and weak. Humanity stands at a great crossroads: will the achievements of the Titans and Cambruin be lost in a frenzy of destruction, or will new Heroes arise to bring Order out of Chaos? Only time will tell. And so, your grace, now you know much of Human history; the glories we have won, the Kingdoms we have forged, and the tragedies our enemies have loosed upon us. Some have said that all Hope is broken since the Turning, and that the final Doom of the World is at hand. I say no. The Sons of Men have faced bitter losses before, and endured hardships unnumbered. Each time we have overcome our enemies, and risen to new heights of civilization. Your blood is of the race of the Ethyri, and it is not much diminished from the glorious Men who walked in the Blessed lands of Ardan. Will you take up Sword and Crown, and undo the shame that has been thrust upon your people and your World?"